Garlic is cultivated and widely used in almost every culture in the world for its myriad medicinal values. The garlic bulb is composed of individual cloves enclosed in a white parchment-like skin. A bulb of garlic generally measures about two inches in height and two inches across in a teardrop shape. Garlic is commonly used in most Chinese cooking, not only to enhance the flavor of foods, but also for its wonderful and endless health benefits. Garlic is an excellent source of vitamins A, B-complex and C. It provides a good supply of minerals like manganese, phosphorus, calcium, copper, potassium, iron and copper. It also contains amino acids, essential oils, glycosides, and the rare essential trace minerals like germanium, selenium and tellurium. The phytochemical in garlic includes antioxidant allium, which is also present in onions, leeks, chives and shallots. Garlic amazingly contains more than 12 types of known antioxidants. Is it any wonder that it has numerous healing virtues? This is one of the few superfoods that doesn’t lose its medicinal properties with cooking. However, garlic in its raw state has its other benefits too. A major health benefit of garlic is its powerful antimicrobial properties that are able to kill disease-causing microbes. We live in a world with millions of microbe species, and having potent antimicrobial foods such as garlic, is a great help to fight what cannot be seen with our naked eyes. Historically, it is believed that Louis Pasteur described the antibacterial effect of garlic in 1858 for the first time, although no reference is available. It was documented that garlic when fighting bacterial infections is able to differentiate between beneficial intestinal microbes and potentially harmful bacteria. Due to the occurrence of unpleasant side effects and increasing resistance to the synthetic pharmaceuticals, garlic was recommended for the treatment of giardiasis. Inhibitory activity of garlic on giardia was encouraging, thus garlic was established as an antiparasite. It was successful in removing the symptoms from all patients within 24 hours, and completely removing any indication of giardisis from the stool within 72 hours, using commercially-prepared garlic capsules. Many fungi are sensitive to garlic, including Candida, Torulopsis, Trichophyton, Cryptococcus and Aspergillus. Garlic extracts have been shown to decrease the oxygen uptake of the fungi and reducing their growth. In the presence of garlic extract, it was found that adhesion of Candida is also greatly reduced, making it easier for them to be eliminated when doing any detoxification protocol. Aged garlic extract, when given to infected mice, the number of organisms were seen to reduce by up to 80%. One study showed that Allicin-containing supplements can prevent attacks by the common cold virus. High blood pressure, or hypertension, is one of the most important drivers of heart diseases and strokes. In an experiment, oral ingestion of garlic extract in hypertensive animals brought the blood pressure back to normal level. Several clinical studies showed that garlic reduced blood pressure in more than 80% of patients suffering from high blood pressure. In one trial, investigation on 47 hypertensive patients showed that garlic significantly decreased the mean systolic blood pressure by 12 mmHg, and the mean supine diastolic blood pressure by 9 mmHg versus placebo. In all studies, no side effect and no serious complication was reported. Atherosclerosis is a condition where the arteries become narrowed and hardened due to a buildup of plaque around the artery walls. This condition disrupts the flow of blood around the body, posing risks of serious complications. Preventive effect of garlic on atherosclerosis has been attributed to its capacity to reduce lipid content in arterial membrane. Allicin, present in garlic is the active compound responsible for the anti-atherosclerotic effect . In most human studies on lipid-lowering effects of garlic and garlic preparations, significantly reduced serum cholesterol, triglyceride and (“bad”) LDL were observed. However, there seems to be no effect on the HDL (“good”) cholesterol specifically. More importantly, garlic significantly reduces the oxidation of the blood cholesterol and the arterial deposits to lower the risks of heart diseases. Several human studies have found that garlic increased fibrinolytic activity in healthy individuals as well as in acute myocardial infarction patients. Garlic has also been shown to inhibit platelet adhesion or aggregation in human investigations. These observations indicate that garlic may be beneficial in the prevention of thrombosis. Thrombosis, as we understand it in layman language means: blood clot formation inside a blood vessel that obstruct the flow of blood through the circulatory system. When thrombosis occurs in a brain’s artery, it causes a stroke. When it occurs in a heart’s artery, it causes a heart attack. The health benefits of garlic revolve around its antimicrobial effect that efficiently combats bacteria, fungi, intestinal parasites, viruses, yeast, etc. Allicin enters the body from the digestive tract and travels all over the body, where it exerts its potent biological effects that neutralize the free radicals in the body. Many studies have suggested possible cancer-preventive effects of garlic preparations. It has been found to contain a large number of potent bioactive compounds with anticancer properties. Different garlic derivatives have been reported to affect molecular mechanisms in fighting free radicals, prevent cancer cells formation, mutation and proliferation. The US National Cancer Institute recognizes that garlic may be the most potent food having cancer-preventive properties. Garlic has antioxidative, antitumor effects, inhibits tumor cell growth and chemopreventive effects. Garlic contains high antioxidants that support the body’s protective mechanisms against oxidative damage. Experimental studies demonstrated a clear hypoglycemic effect of garlic. Many studies showed that garlic can reduce blood glucose in diabetic animals. The beneficial effect of garlic on diabetes mellitus is mainly attributed to the presence of volatile sulfur compounds, such as alliin, allicin, diallyl disulfide, diallyl trisulfide, diallyl sulfide, S-allyl cysteine, ajoene, and allyl mercaptan. Garlic extracts have been reported to be effective in reducing insulin resistance. Several studies showed that garlic can protect the liver cells from some toxic agents. For example, overdose of acetaminophen is known to cause liver and kidney toxicity in humans. It was demonstrated that garlic protects against acetaminophen-induced liver toxicity. Another drug-induced toxicity was being examined—gentamycin (or gentamicin). This drug is used for treating a variety of bacterial infections but found to induce liver damage, as revealed by elevation of liver damage marker enzymes (AST and ALT), and reduction in plasma albumin level. Dietary inclusion of garlic powder protects the liver against this drug-induced toxicity by improving antioxidant status and modulating oxidative stress. One large 12-week study found that a daily garlic supplement reduced the number of colds by 63% compared with placebo. The average length of cold symptoms was also reduced by 70%, from 5 days in placebo to just 1.5 days in the garlic group. Another study found that a 2.56 grams/day dose of garlic extract can reduce the number of days sick with cold or flu by 61%. If you tend to catch colds easily, then adding garlic to your diet could be incredibly helpful. Garlic acts as a medication for the cold, helps relieve congestion and aids in speedy recovery. Eating raw garlic takes some getting used to. But understanding all the health benefits of garlic, try to include them in your daily diet. Sneak one or two cloves or garlic into the juicer when you juice your favorite juice recipe. Finely chop up two cloves of fresh garlic and let it expose to the air for a few minutes while you wash up your blender or chopping board. 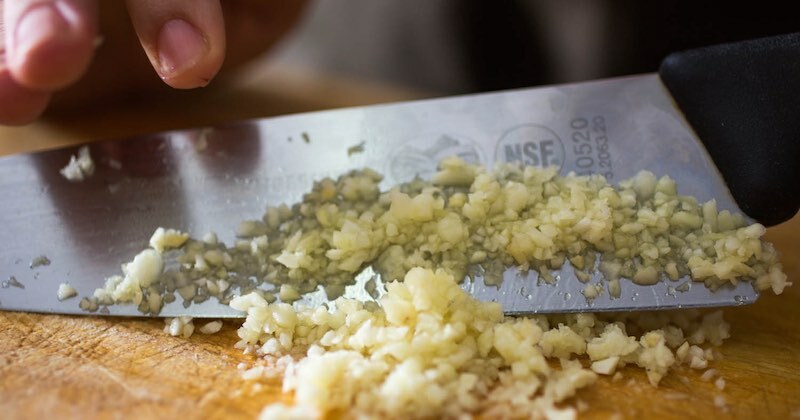 The chopping releases the enzyme alliinase in the garlic. Gather the chopped garlic in a spoon and swallow it with water. You may add a little raw honey if desired, which will give it more mileage as raw honey is a great anti-bacterial agent. Manuka honey can also be used, especially if you want to address a sinus issue or stop a cold or flu. The garlic and honey will travel your entire digestive tract while you sleep and scavenge and neutralize all the toxins, carcinogens, harmful bacteria, fungi, viruses, foreign chemicals before they can harm your healthy cells. The sulfur compounds in garlic will also detoxify your liver of blood toxins, lead and other heavy metals that will be flushed out the next day. Swallowing the chopped garlic will not give you garlic breath, as long as you don’t chew it. In the morning, drink a big glass of water with a squeeze of lemon juice. Your first bowel movement will have a strong garlic odor and you will know that the harmful stuff have been eliminated from your body. Try it! 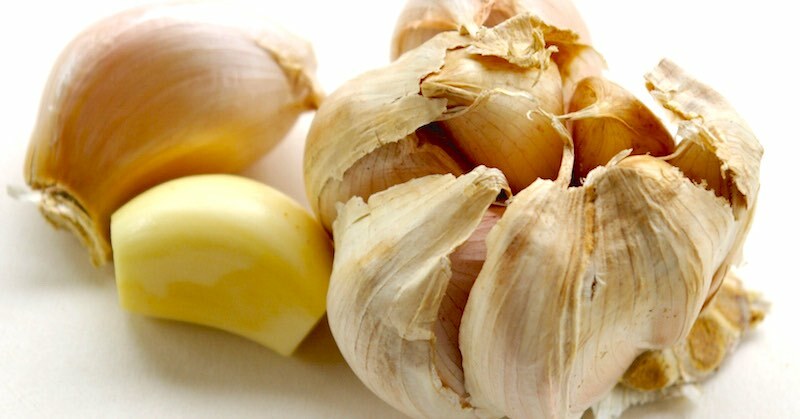 Learn how to peel garlics in two seconds. Garlic is a very potent medicinal herb. 2-4 raw cloves daily is sufficient for you to enjoy all the health benefits it has to offer. A little more when semi-cooked is fine. Garlic has a blood-thinning effect, therefore, do not take it with other anti-coagulant drugs. Avoid taking large quantities of garlic. Although rare, high doses of garlic may trigger some health problems for some individuals—causing anemia, weight loss, excessive gas, diarrhea or asthma. It is safe to eat raw garlic at any time, but if eating raw garlic daily, do not eat on empty stomach as in the long-term it may be a little harsh on the stomach wall lining. Some individuals may be intolerant to a compound in garlic called fructans. Should you experience abdominal pain, bloating or flatulence after eating raw garlic, this could be the reason. I love my garlic cloves and I usually take it in fall and winter. Onions is my favorite and also ginger roots. I haven’t been sick in a long time and I usually intake homemade teas as well. Been taking a garlic clove a day for a while and it definitely does a lot. One IMPORTANT note. Do not buy chinese garlic, it’s full of chemicals and heavy metals. When you buy garlic make sure it says California on it or U.S.A. Grown. I’ve had them both. When I switched over to California garlic there was a huge difference, even down to the triple strong taste comparative to the chinese trash.